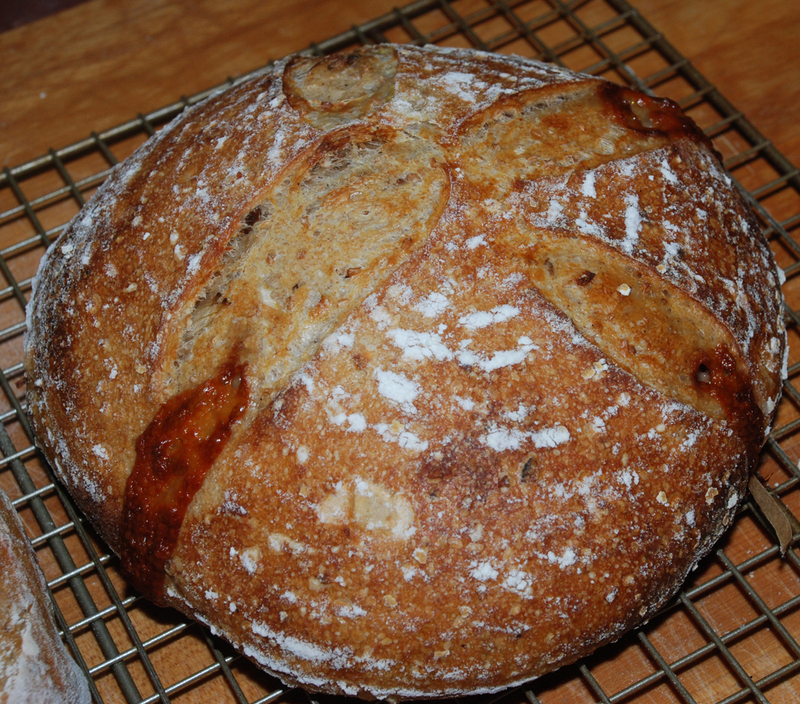 I was inspired to try adding some balsamic vinegar into one of my breads after reading about Karen Hanseata’s Wild Rice bread on the Fresh Loaf this past week. I have some cherry balsamic that I love using so I was curious to see if it would have any affect on the taste of my bread. While looking for some different components to add to my next bake I discovered that my wife had stashed some Toasted Almond Flour in the refrigerator so I figured why not give it a try. 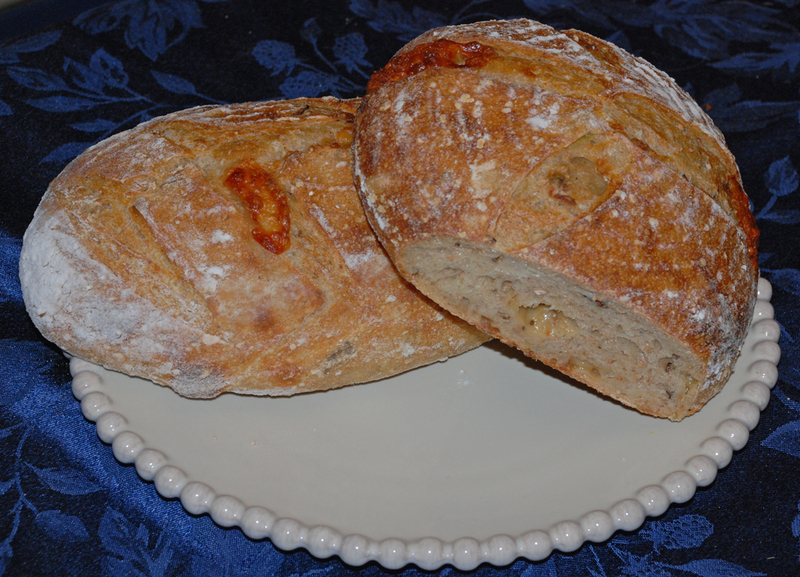 I also used some Potato flour and Durum flour along with some hickory smoked sea salt and assorted all natural grains for this bake. 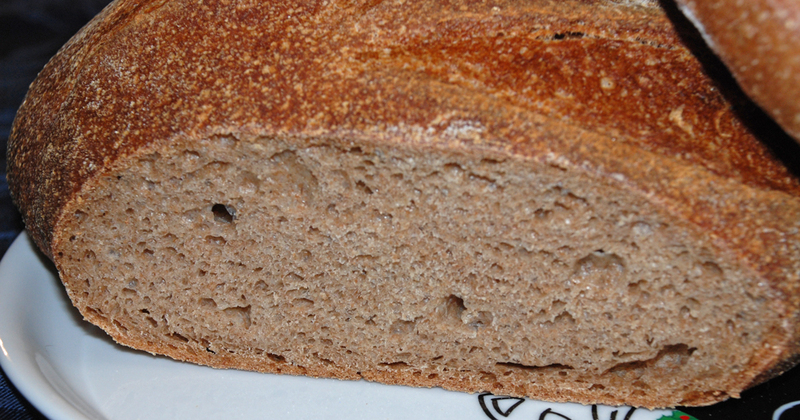 I cut back on the hydration slightly from my previous multi-grain breads and not counting the 359 grams of water used in the soaker it comes in at only 56%. There is no doubt that the water from the soaker makes the final dough much moister than 56%. 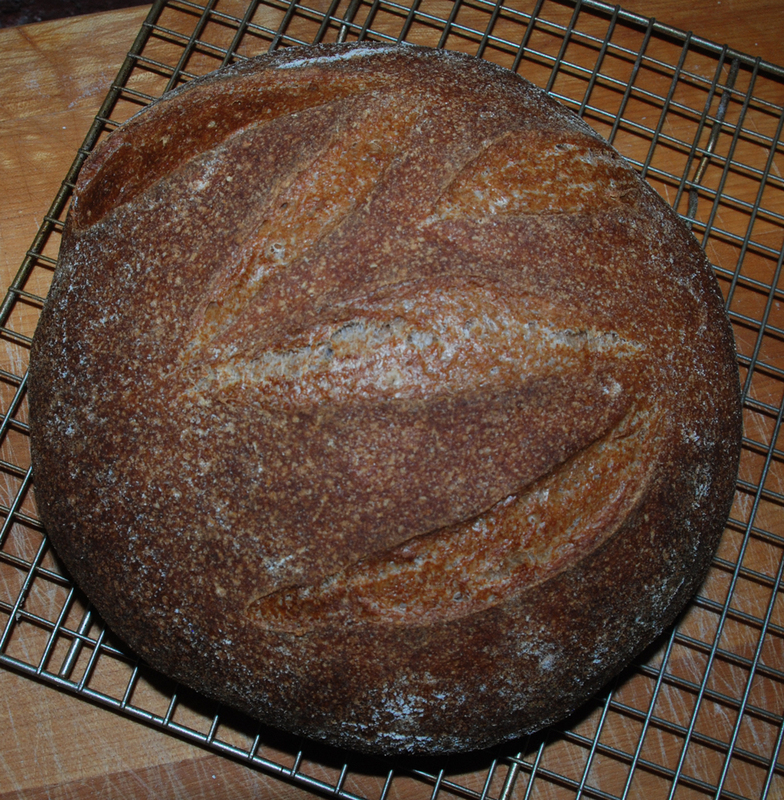 I also did not count the soaker grains as part of the flour. According to the BBGA (Bakers Guild of America) soakers including the water and other ingredients should be considered “hydration neutral”. This is obviously a difficult concept to control but none the less that is the prevailing rule in the industry. 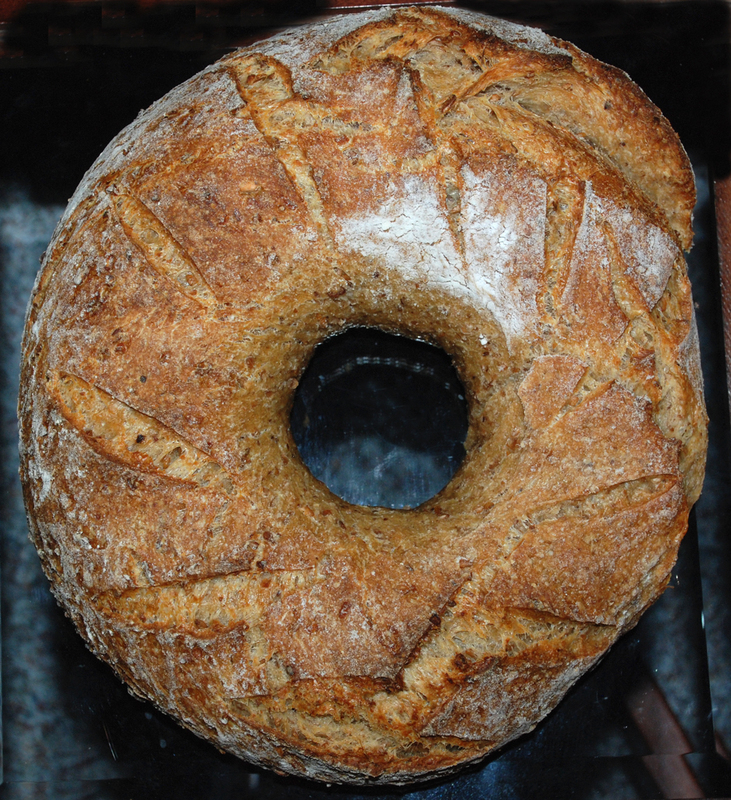 For this bake I made a boule as well as a circular shape similar to a large donut. The final dough came out very tasty. You can see the toasted almond flour imparted a slightly orange tinted color in the crumb and it gives it a very nutty flavor. I can’t say that I tasted the cherry balsamic vinegar but I’m sure it added to the overall flavor profile somehow. 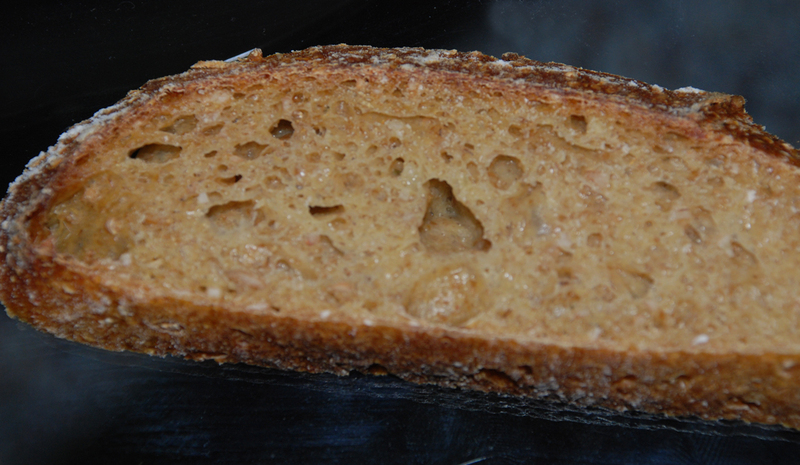 The crumb is nice an open and moist and you can see some of the soaker grains melded together. If you venture to try this, please let me know how your attempt comes out. 264 Grams Water, 90 degrees F.
Mix all ingredients for soaker in a bowl and add boiling water. 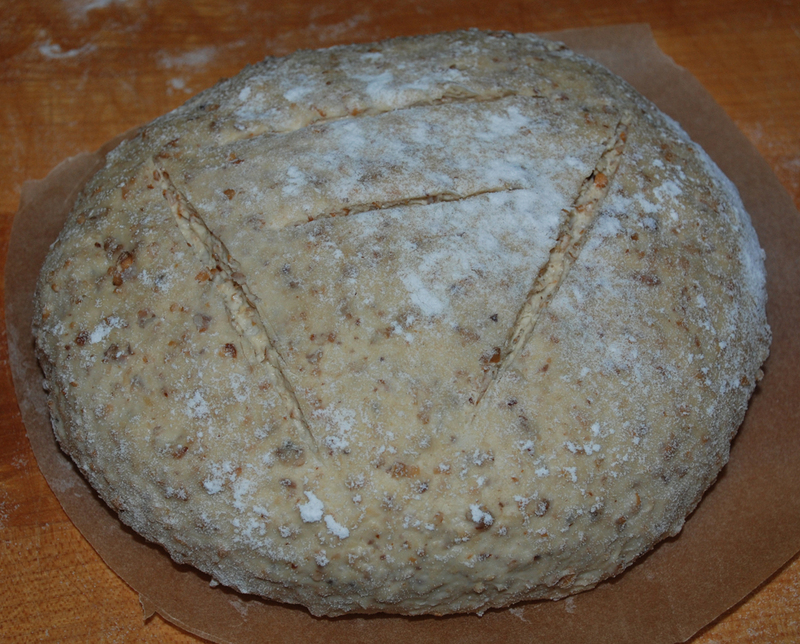 Let it sit for 2-3 hours covered until the grains are soft. (I actually only let it sit for 1 hour which was long enough). Add the water and flours into your mixing bowl and mix for 2 minutes on low. The dough should come together in a shaggy mess and should be relatively moist at this point. Let it rest (autolyse) for 25 minutes and then add the salt, balsamic vinegar and the soaker and mix for 4 minutes more on medium low-speed. If necessary you can add some additional water or flour but be careful not to make the dough too dry. It should be relatively sticky but not soupy. Remove dough from mixing bowl to work surface and do a stretch and fold. 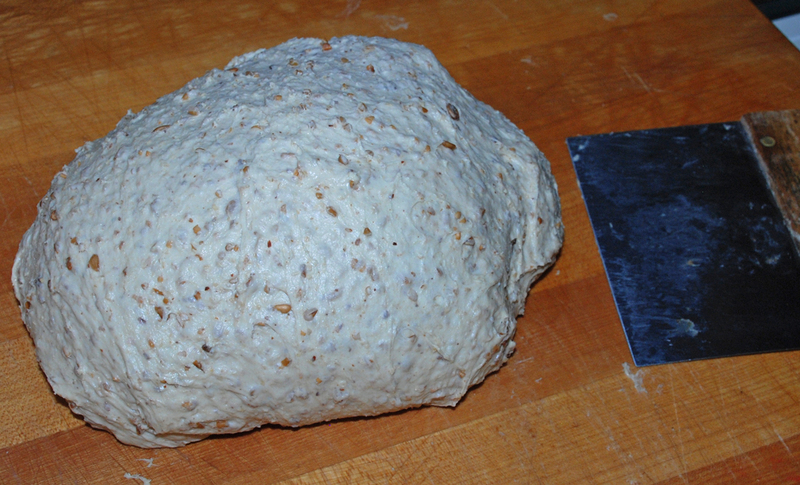 You may need to wet or oil your hands and the work surface since the dough will still be very sticky at this point. Form the dough into a ball and let it rest uncovered for 10 minutes. Let the dough rest uncovered for 10 minutes. After 10 minutes do another stretch and fold and cover the dough with a moist lint free towel or plastic wrap sprayed with non-stick cooking spray. Do another stretch and fold two more times letting the dough rest 10 minutes each time. 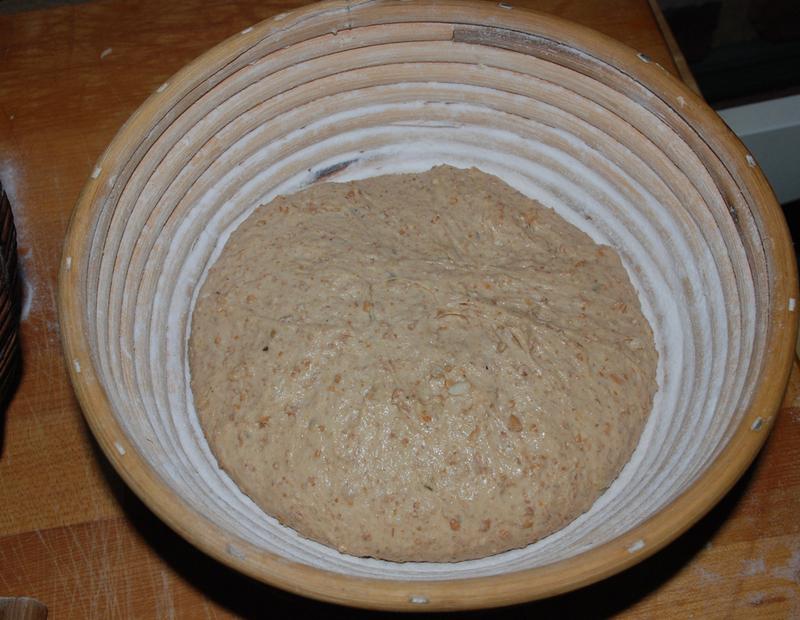 After the last stretch and fold put the dough into an oiled bowl and cover it tightly. 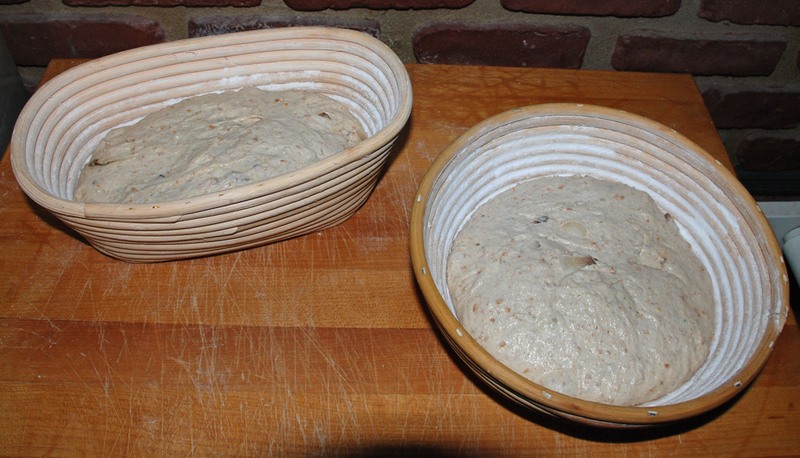 Let the dough sit in your bowl for 2 hours at room temperature. It should only rise slightly at this point. After the 2 hours are up put in your refrigerator for at least 12 hours or up to 3 days. 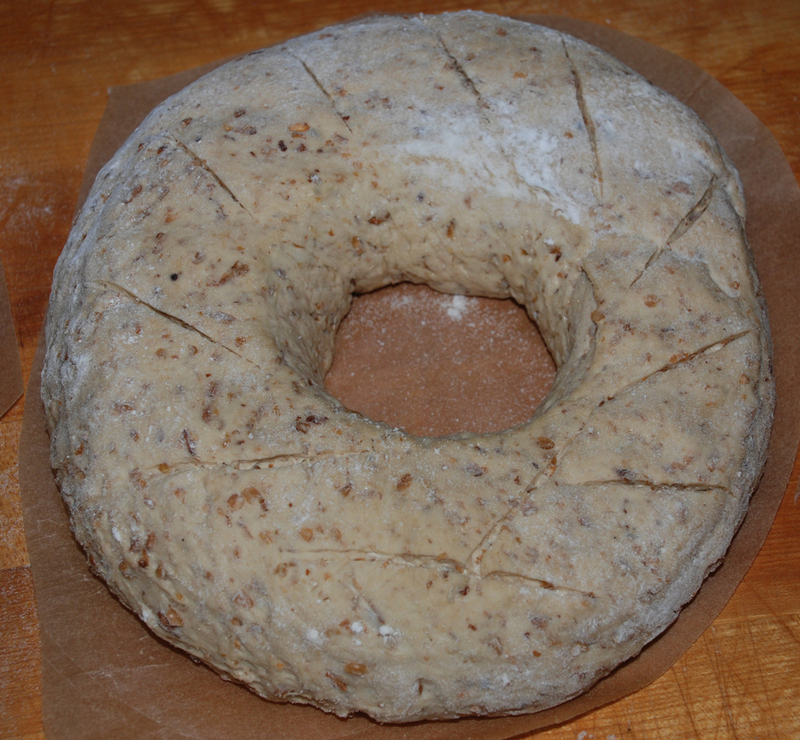 To make the circle bread I formed half the dough into a cylinder and formed it into a circle. I placed a small glass bowl in the middle wrapped in plastic wrap that I sprayed with cooking spray to prevent it from sticking to the dough. 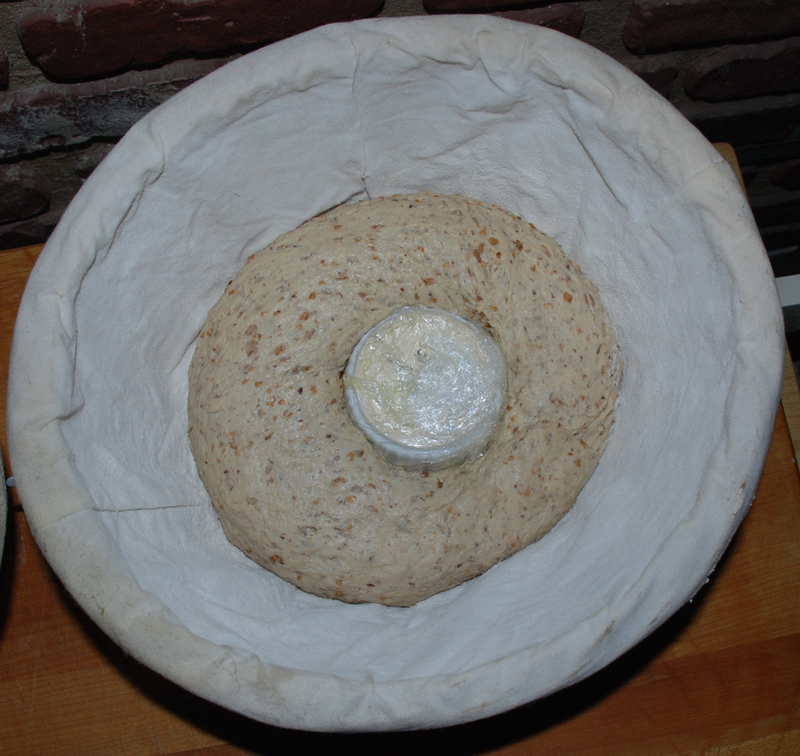 I placed the dough into a large banneton and let it rest per below. Now that I finally made the famous Phil’s 100% Whole Wheat Desem bread I figured it was time to push the envelope and put my own twist on it. I love onions so I added some toasted onions and figured I would try to mix up the flour a bit by adding a small percentage of Quinoa and Barley flour. 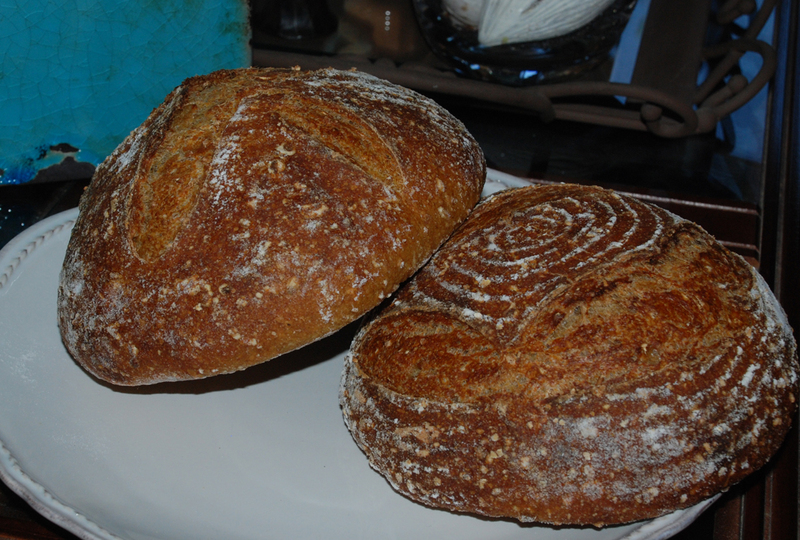 Both of these flours impart a nice nutty flavor to the dough along with the toasted wheat germ I also added. I also added some dehydrated onions since I ran out of the toasted onions and wanted to make sure I used enough in the recipe. Just for the hell of it I added some pistachio oil to make it even more nutty tasting. 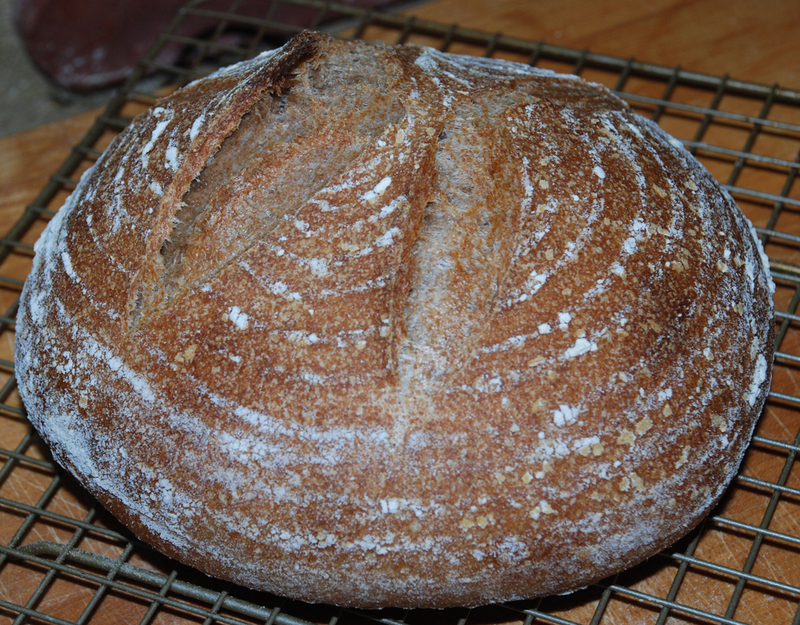 I refreshed my whole wheat starter I built for the last bake of 100% Whole Wheat Desem bread and the next day away we went with mixing the final dough. 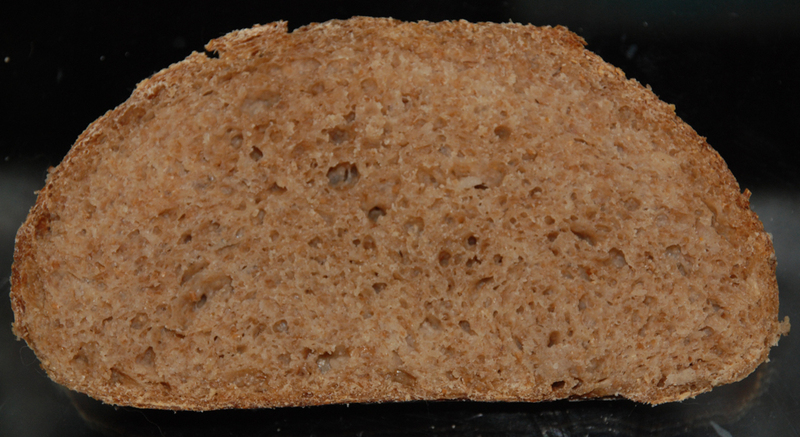 Please see Phil’s original recipe for his formula for 100% Whole Wheat and his original procedures here http://www.thefreshloaf.com/node/27999/honest-bread-100-wholewheat-desem-bread-and-some-country-bread. 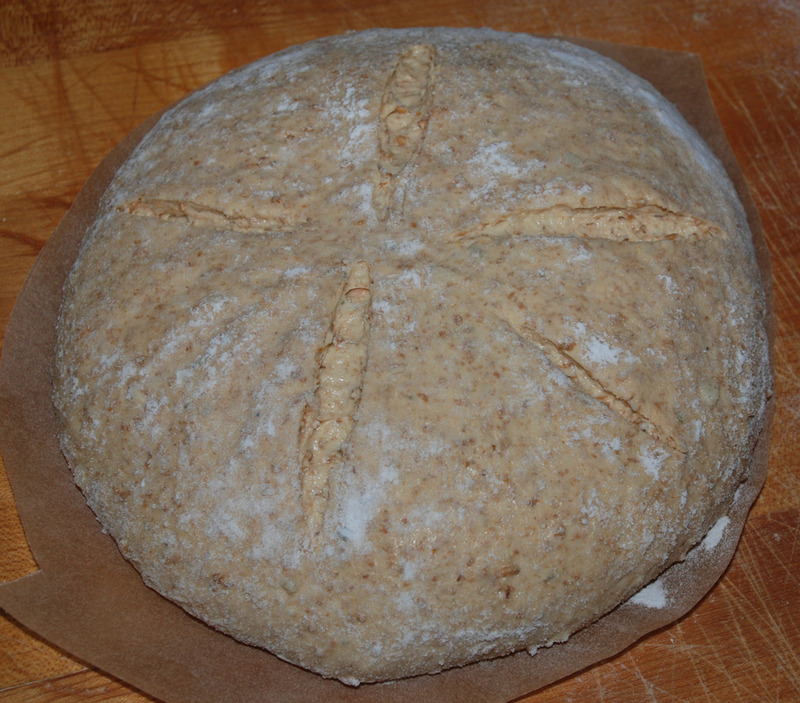 I mixed the flours and wheat germ together with all the water except for 50 grams and let them autolyes for 1 hour. I added the dried toasted onions to the remaining 50 grams of water. After an hour I added the levain and the water with onions, pistachio oil and salt and mixed on speed #1 for 1 minute and #2 for 4 minutes. I then did a stretch and fold, rested the dough uncovered for 10 minutes. I then did another stretch and fold, covered the dough and let it rest for 10 minutes. I did one more stretch and fold and put it in a lightly oiled bowl for 1.5 hours. I then put it in the fridge overnight. 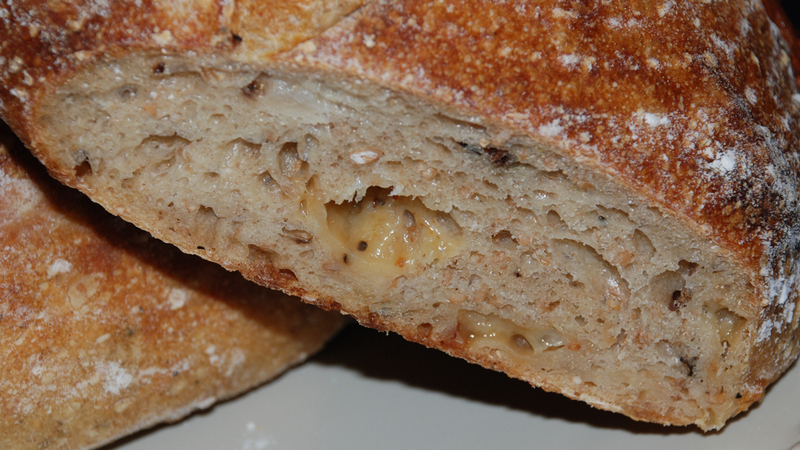 The bread had a great nutty flavor and you can taste the barley and quinoa flours for sure along with the onions. 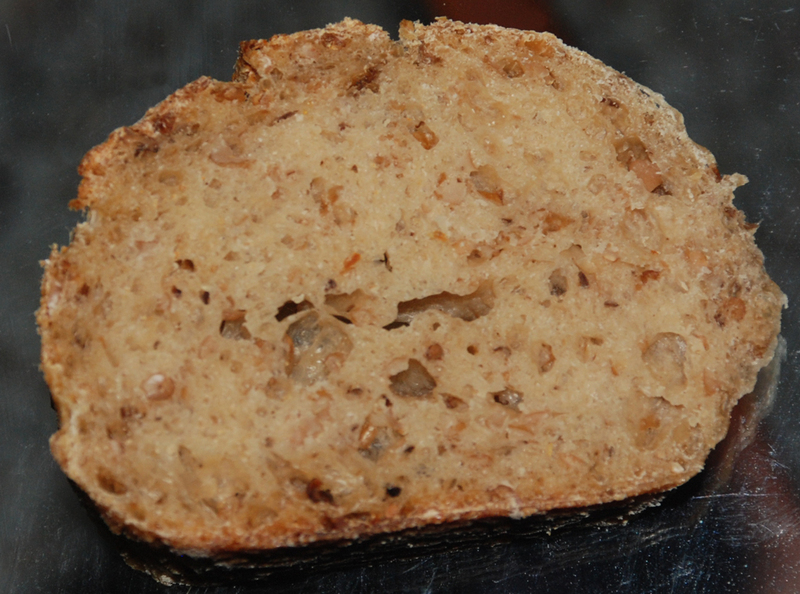 The crumb was nice and moist and open with a nice dark medium hard crust. I had some leftover sweet potatoes from dinner the other night and after refreshing my starter I decided it was time to concoct something new and different. I figured I would throw in some dried roasted garlic and what better than maple syrup to go with sweet potatoes. Naturally I had to be different and use some raspberry flavored maple syrup that we had picked up in Vermont a while ago. 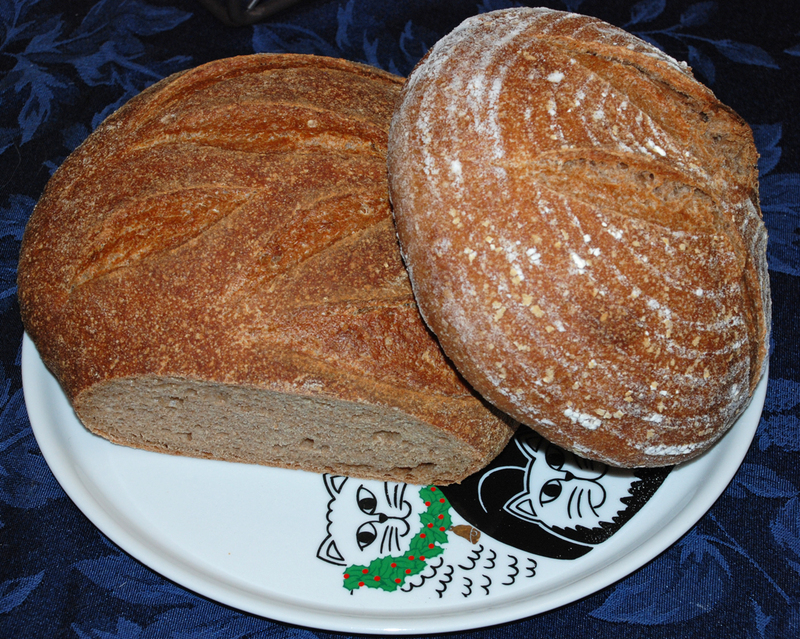 I love the nutty flavor spelt flour adds to bread along with roasted wheat germ and cracked wheat. Including the water and syrup the total hydration for this dough is 73% and it definitely a wet style dough. If you are not comfortable working with wet dough you can certainly add some additional flour or decrease the amount of water a bit. 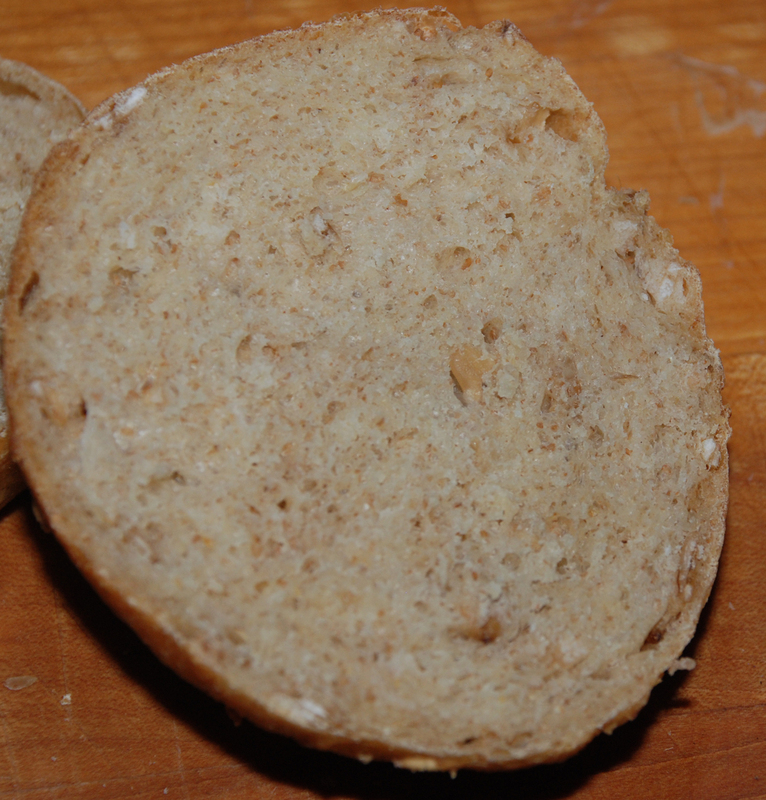 The final bread came out with a wonderful complex nutty flavor. 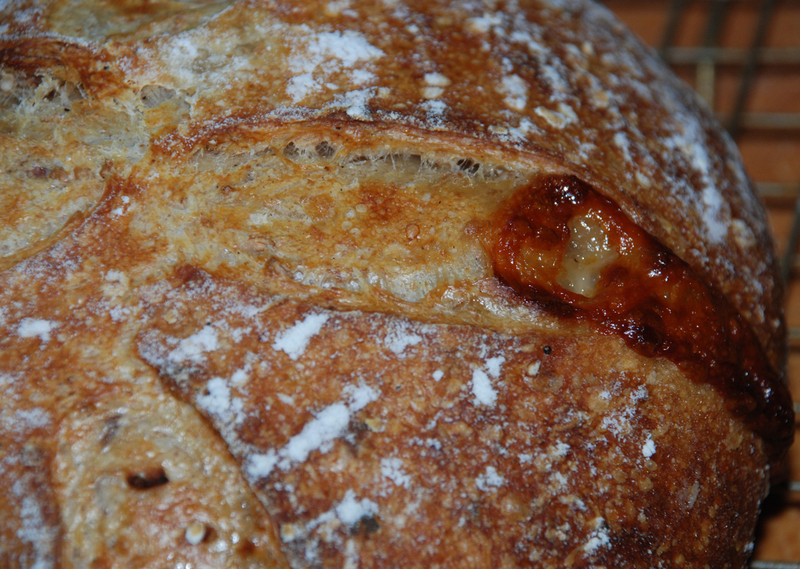 You can taste the toasted garlic for sure, but the raspberry maple syrup is not noticeable at all. 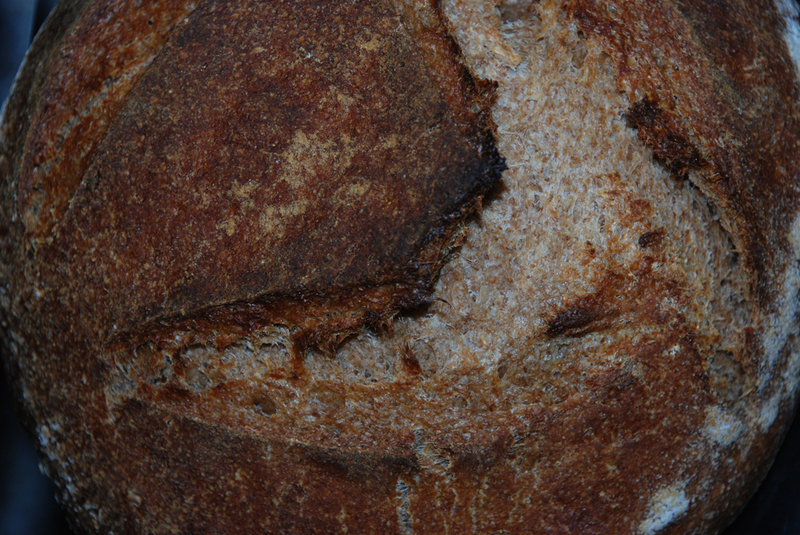 It has certainly added to the dark appearance of the bread, but the flavor is hard to notice. 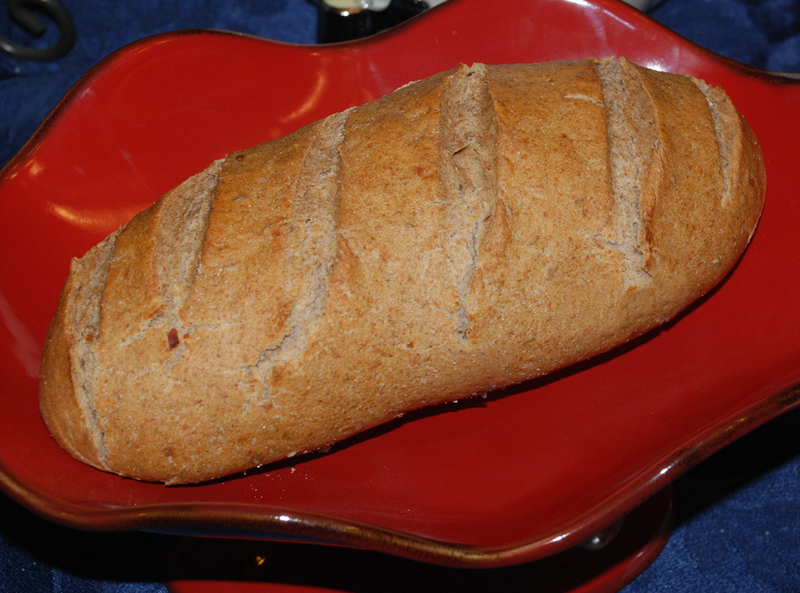 The sweet potatoes contribute to the rich flavor and dark color of the bread and were a great addition to the overall formula. 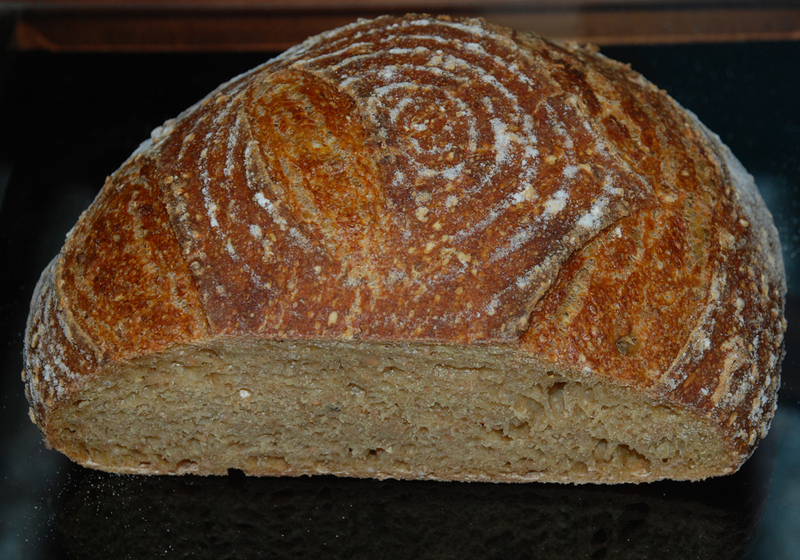 The crust is nice and dark and crunchy with a moist and flavorful slightly chewy interior. I had a few slices with some cream cheese for breakfast a few minutes ago and it was very tasty. I’m sure this is going to make great toast and would be ideal for a steak sandwich. Prepare the starter the night before and let it sit at room temperature for at least 10 hours. After 10 hours it should be doubled or more in volume. Deflate the starter and put in your refrigerator for up to 2 days or use it immediately. Take the starter out of the refrigerator and let it warm up for about 20-30 minutes. Break it up into 5-10 pieces and put it in your stand mixer or work bowl. Add the cracked wheat to the water and let it soften for about 5 minutes. Next add the water with the cracked wheat with the starter and mix on low for 30 seconds to break up the starter. 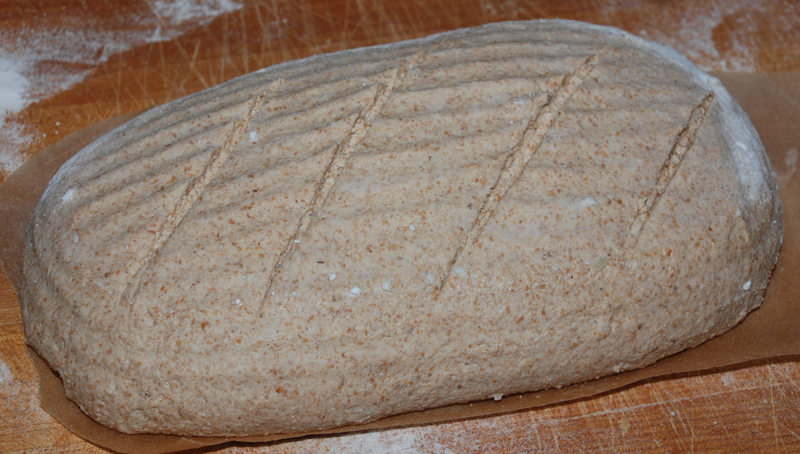 Use a wooden spoon or rubber spatula to break up the starter. Now add all of the flours, sweet potatoes (mash them slightly before adding), maple syrup and roasted garlic. Mix on low for 2 minutes. Let the dough sit for 15 to 20 minutes. Next sprinkle the salt over the dough and mix on medium for 4 minutes. The dough will still be fairly wet and loose at this point which is fine. 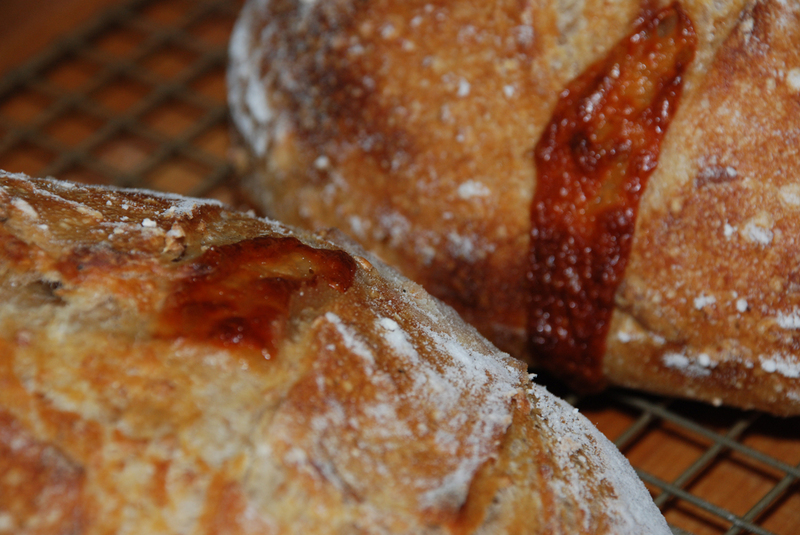 Resist the temptation to add too much additional flour. 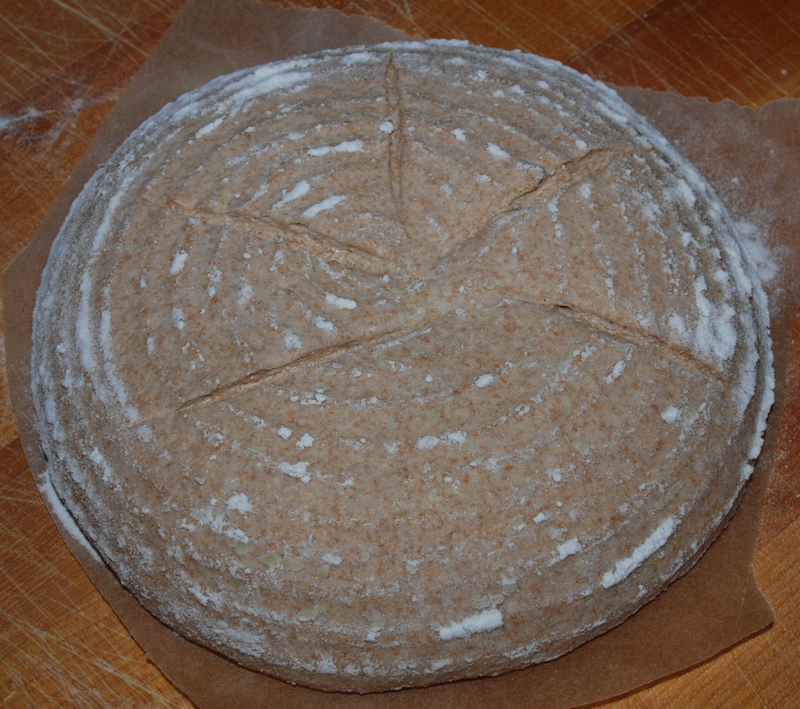 If the dough is like soup then you should add some more flour until it starts to come together. Remove the dough to your work surface and using a dough scraper stretch and fold the wet dough for a couple of minutes and form it into a ball. Let it sit uncovered for 15 minutes. Do another stretch and fold several times and cover the dough with either a moist clean towel or a slightly oil sprayed piece of plastic wrap. Let it sit for another 15 to 20 minutes before you do another stretch and fold. The dough should start to feel more tacky than wet and sticky at this point. Let it rest again for 15 to 20 minutes and do one more stretch and fold. 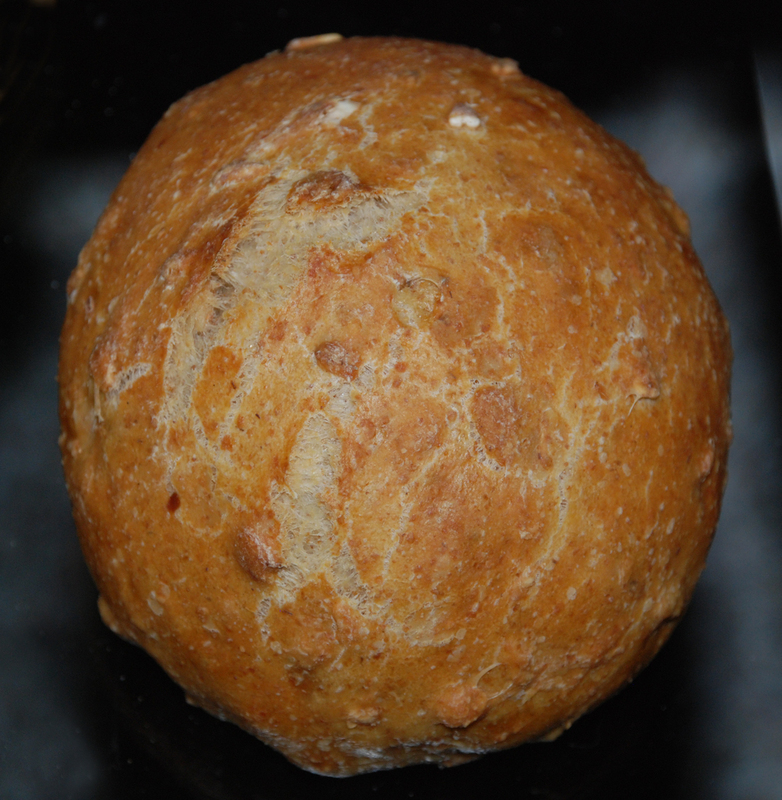 Form the dough into a ball again and place it in a slightly oiled container or bowl and cover it tightly. Let it sit at room temperature for 1.5 hours and then put it in your refrigerator for 24 hours or up to 3 days. 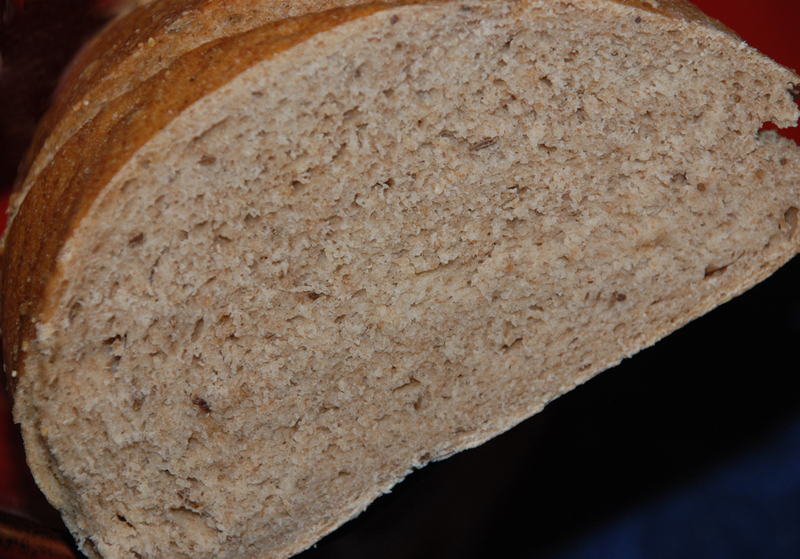 When ready to bake the bread, take it out of the refrigerator and let it sit at room temperature for 1 1/2 to 2 hours. Now shape the dough as desired on a floured work surface being careful not to handle the dough too roughly so you don’t de-gas it. 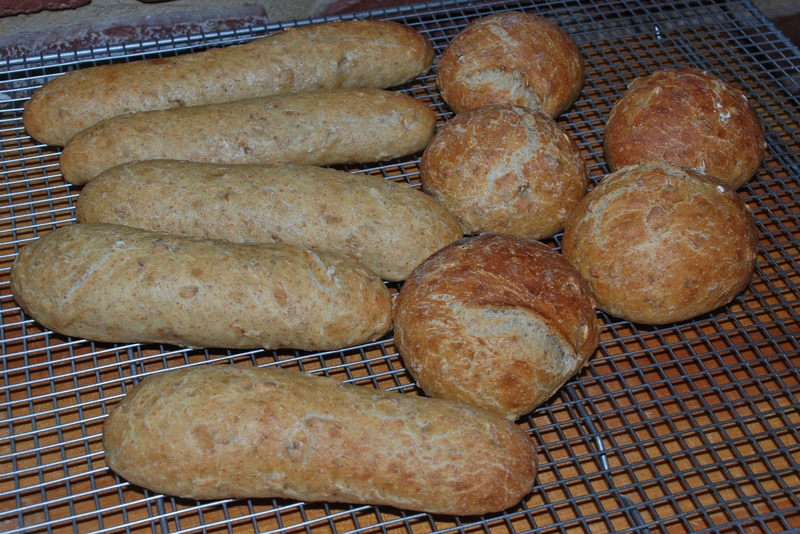 Place it in your bowl, banneton or shape into baguettes. 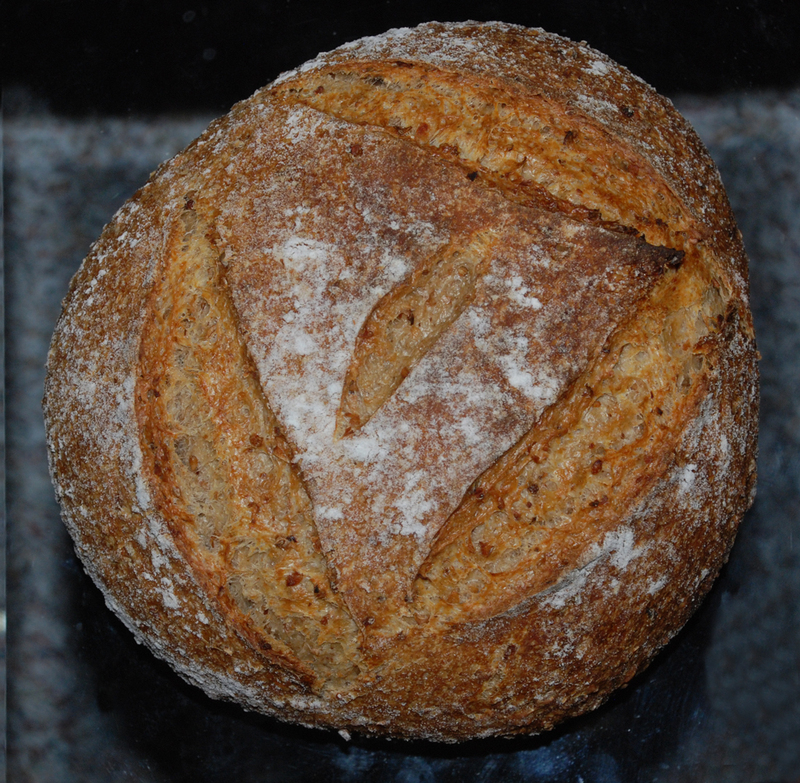 I made 2 loaves with this recipe and shaped them into boules. 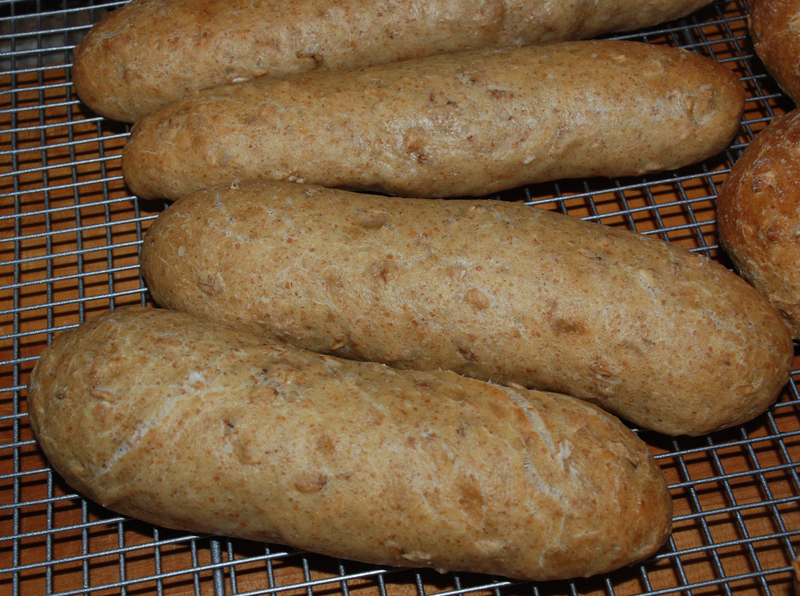 I’ve been wanting to try my hand at making Phil’s 100% Whole Wheat Desem bread since it sounded so simple but yet so good. 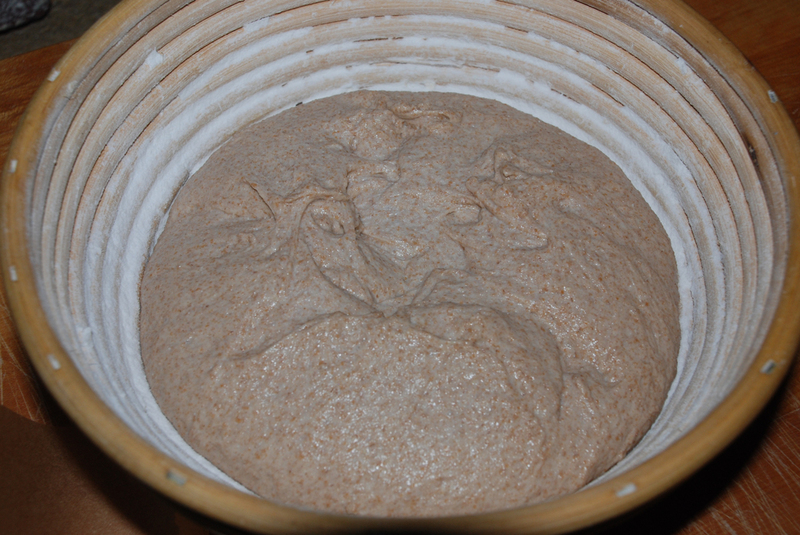 I had started preparing the Desem starter a while ago but had to abandon it when I went away for business. I was not thrilled with the way it was turning out anyway so it wasn’t a great loss. I decided to try a different approach for building the starter from my 100% AP White Starter by doing a 3 stage build. 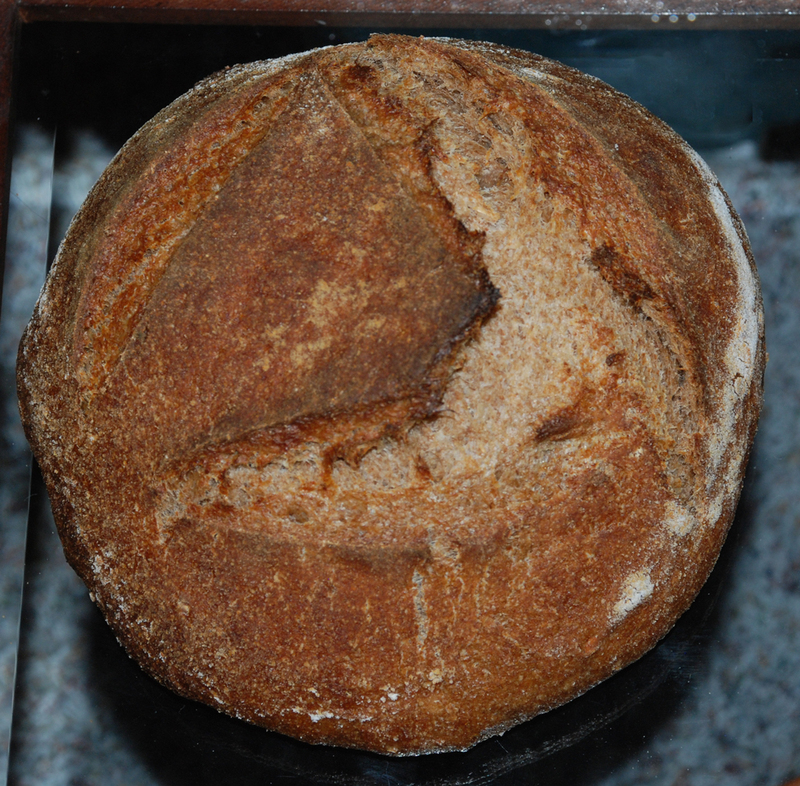 For the first build I used 50 grams of seed starter, 125 grams Bread Flour (KAF), 75 grams Organic Whole Wheat Flour and 200 grams of water. I mixed this up and left it out at room temperature overnight for around 10 hours. I then put it in the refrigerator until that evening when I proceeded to stage 2. 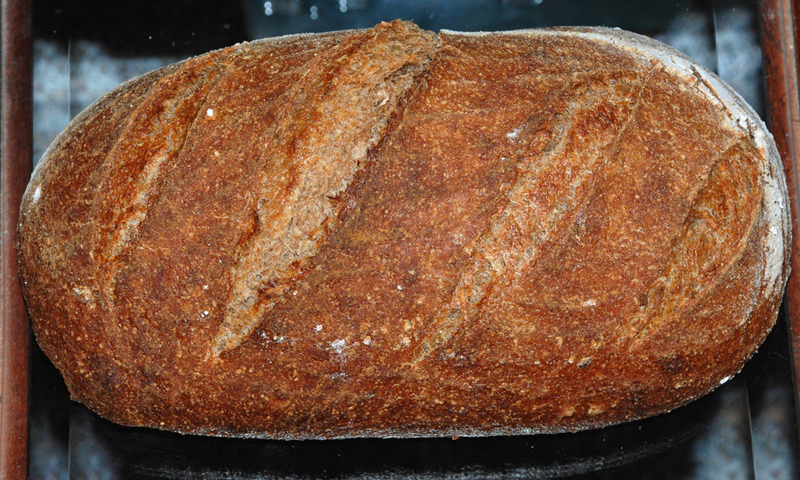 I added 142 grams of Whole Wheat, and 85.4 grams of Water. I left this out again overnight and put it in the refrigerator until the next evening. For the third and final build I added another 142 grams of Whole Wheat and 85 grams of water. 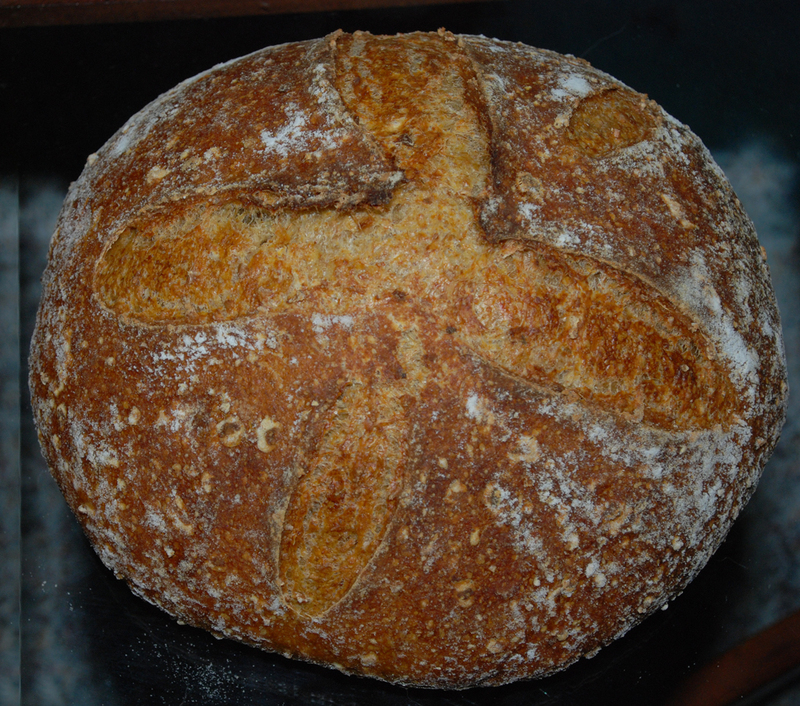 I left this out for one more evening and refrigerated it until that evening when I prepared the final dough. I ended up making a lot more starter than I needed, but it was worth building it up to around 61% hydration as the starter was nice and fruity and ready to go to work! 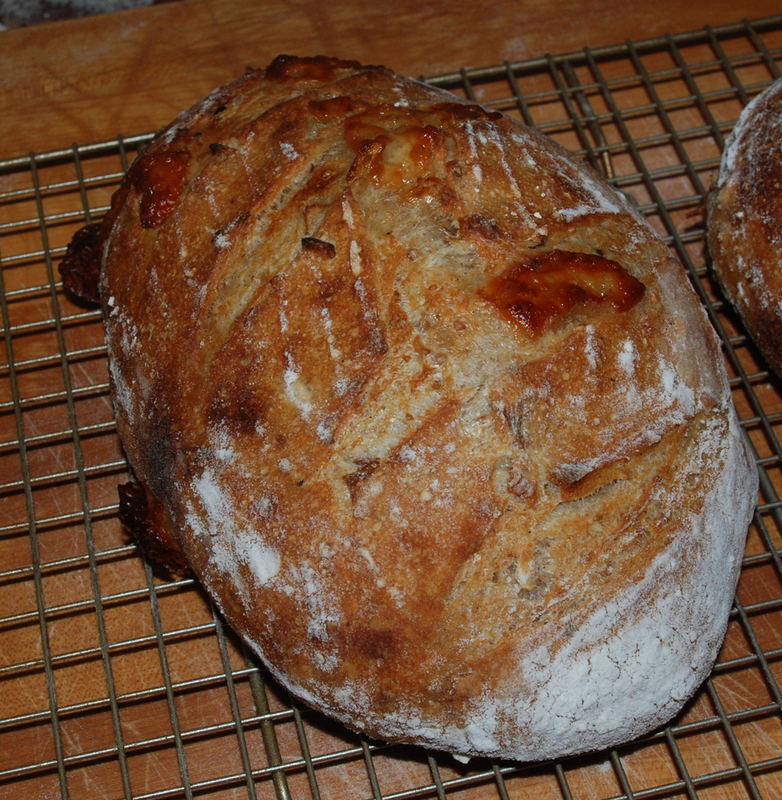 After the flour autolyes for 1 hour I added the levain and mixed on speed #1 for 1 minute and #2 for 4 minutes. I then did a stretch and fold, rested the dough uncovered for 10 minutes. 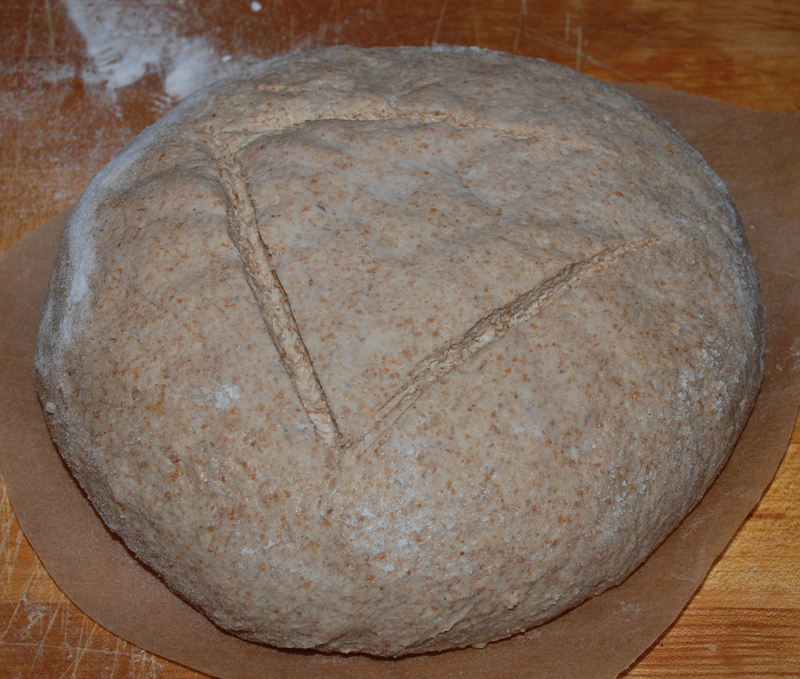 I then did another stretch and fold, covered the dough and let it rest for 10 minutes. I did one more stretch and fold and put it in a lightly oiled bowl for 2 hours. I then put it in the fridge overnight. 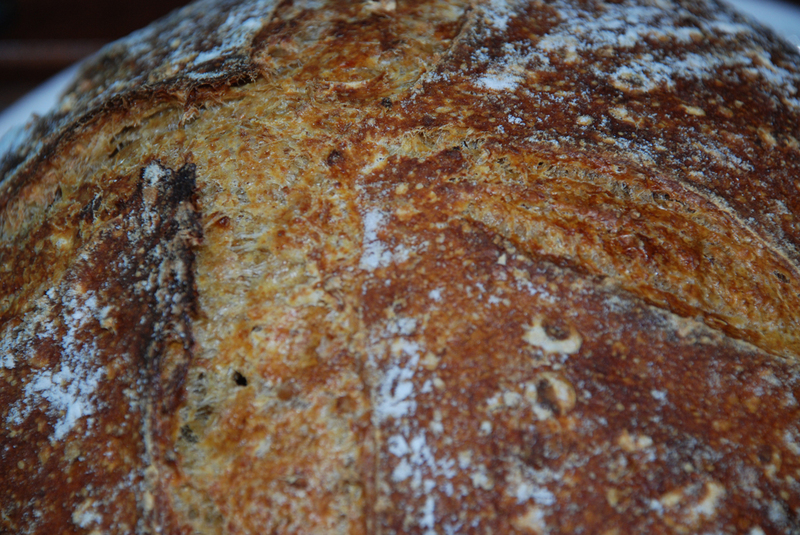 The dough lived up to all of its good press and had a nice slightly sour/sweet taste. I have been eating it all week and it makes great toast!